With a targeted combination of unique airflow control and sound insulation features, the Silent Base 801 is a truly superior case ideal for high-end gaming gear and for quiet systems. be quiet! is justifiably famous for making some of the most technologically advanced and quietest PC equipment available. 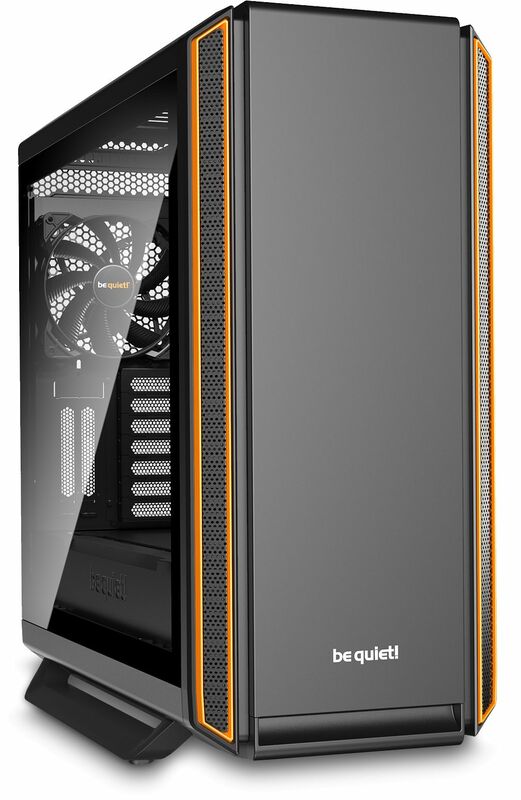 True to the motto “form follows function” the PC case Silent Base 801 Window Orange offers the perfect symbiosis of noise prevention, cooling performance, good usability and an extensive capacity for high-end hardware. The air inlets on the front cater for minimum noise with a constant amount of air permeability. The specially designed vents reroute the inflowing air twice to reduce airborne noise. The front, top and sides are equipped with 10mm extra thick dampening mats, resulting in maximum stability and superb noise dampening capabilities. The decoupled PSU bracket, motherboard tray and HDD cages also minimise vibrations. The full metal body provides stability for the case and improves its haptic. Three pre-installed Pure Wings 2 140mm fans with airflow optimised fan blades ensure perfect airflow and solid cooling. The integrated 3-step fan controller allows to set the speed of up to six fans manually or connect all to one PWM signal. The PSU shroud perfectly covers the cables, PSU and contains a double HDD cage. The cover plates are detachable to install a 140mm fan on the top. With the small cover detached a 360mm or 420mm radiator can be installed at the front. Using the PSU bracket the power supply unit can be easily installed from behind. The high-end side panels provide a mounting system with push-pins for secure and user-friendly detachment. By depressing the push-pins the locking mechanism releases the upper part of the side panel and this hovers safely until removed manually. Excellent usability for fast and easy access to the interior of the case. The motherboard tray is decoupled and can be installed alongside the left panel in an inverted layout. It is also removable for use as a test bench. 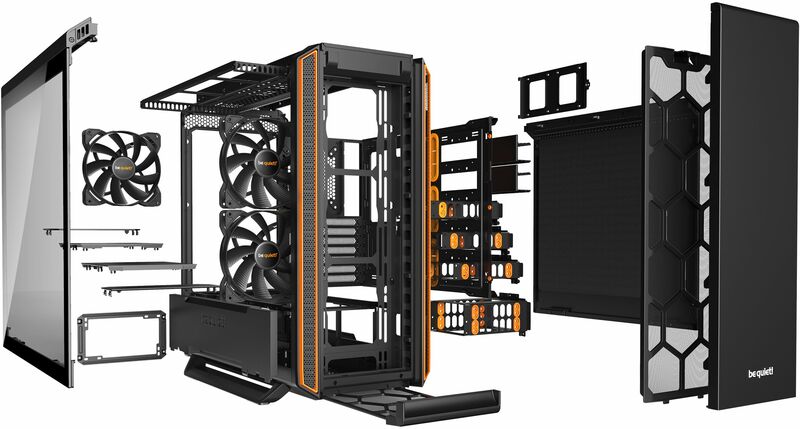 The Silent Base 801 Window provides generous dimensions and cutouts to install most kinds of hardware, even an E-ATX motherboard. 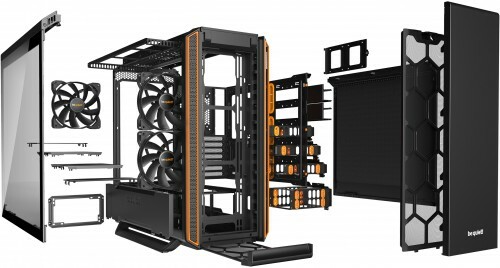 The smart arrangement of components allows multiple graphics cards and large CPU coolers to fit in well. Three HDD cages are included and can be installed for individual needs. With its optimised design Silent Base 801 Window is the perfect case for water cooling. Radiators of up to 420mm can be installed at the front, top and rear. Using the detachable bracket radiators can be installed very quickly and easily at the top. 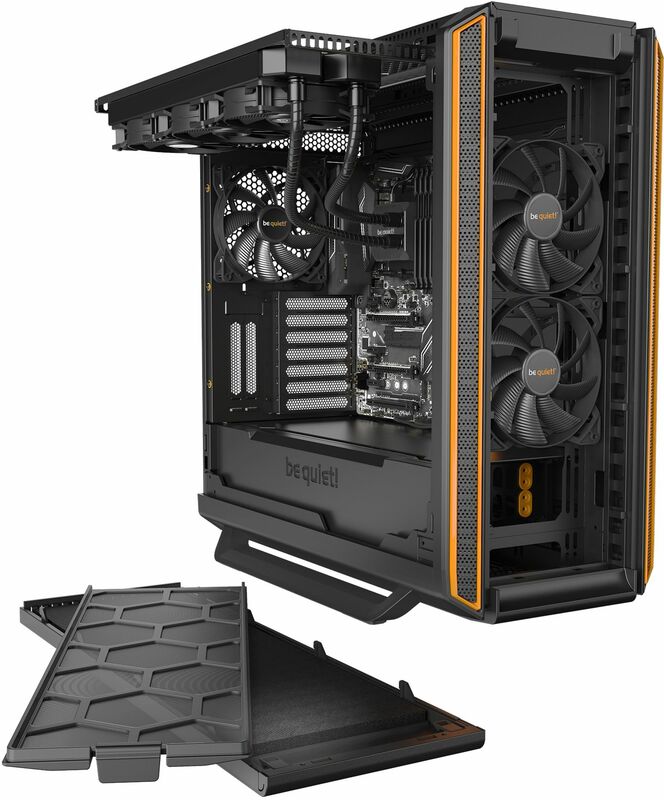 The high-quality, fully windowed side panel offers a perfect view of the components inside your PC case. The window is made of tinted and tempered glass with black painted side bars.